Exclusive! 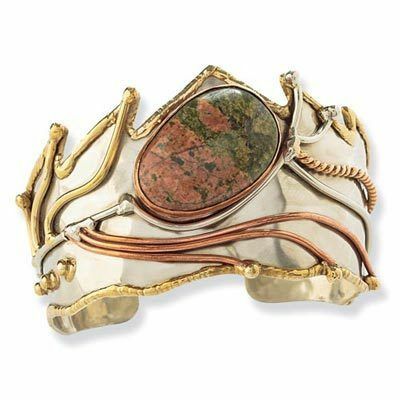 Our Natural Stone Cuff Bracelet is truly unique—each stone is one-of-a-kind! Shimmering silver-tone setting is accented with brass elements and a lovely natural motif. Set in the middle of each piece is a pretty unikite stone that's said to bring positive feelings, build self-confidence and give you the power to take over your own life. Natural stones will vary. Cuff bracelet 1¼"w.